If you missed the game on its first run, you should check it out when it debuts on 3DS! 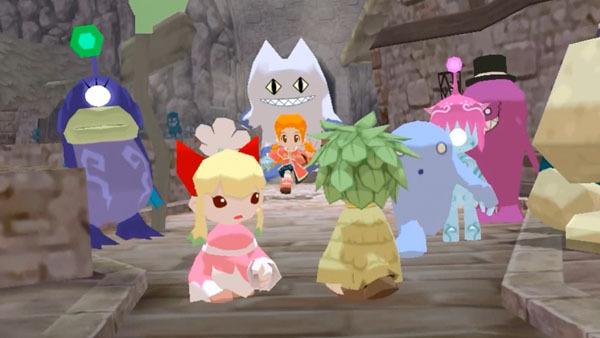 Mastiff's upcoming Gurumin 3D: A Monstrous Adventure is coming to 3DS via the Nintendo eShop later this summer, and with it is a special trailer and screenshots that debuted today. Mastiff will be showing off the 3DS version of the former PSP and PC release at PAX West in Seattle from September 2 to September 5, and if you've never played it before, the Falcom-developed RPG is one of the cutest and most adorable games coming up this fall. You'll follow a young girl named Parin who's sent to live with her grandfather in a littlke mining town while her parents are hanging out excavating ruins as archeologists. When Parin happens upon a little girl who might be attacked by an angry dog, she rescues the girl and finds out that she's actually a monster, and is in turn invisible to adults. She's taken to the Monster Village, where she learns about an ancient evil known as Phantoms that are about to take over the world. Obviously Parin's on a quest to make things right again. Gurumin 3D: A Monstrous Adventure is going to be a fun one, so be on the lookout for our review!